Wrote RS Logix 5k supervisory and control code for the leaf threshing section of the plant. This code operates over 200 motors - a combination of fixed and variable speed units for threshing, conveying, and separating machinery. Interface logic was provided to communicate with 3 other Logix 5k processors as well as 6 FactoryTalk View SE clients hosted by redundant servers. I configured Ethernet, ControlNet, & DeviceNet nodes, scanners, and switches for all 5 sections of the plant - prep, threshing, drying, packaging, and dust houses. I wrote the supervisory and control code for dust collection, which includes multiple 250 HP variable-frequency drives. Testing, debug, startup, commissioning, and initial operator training services for the threshing line were provided to effect a smooth project turnover to the owner. In 2013 I provided additional, similar services, re-factoring the existing Logix code in the leaf packaging section of the plant to improve execution time, add a 3rd case press and add a 3rd box strapping line. Designed control system for a new dual-train flue gas desulfurization wastewater treatment plant at an existing fossil-fueled generating station. The design included hot standby A-B PLC processors, fully redundant fieldbus I/O, redundant control and supervisory networks, HART multi-drop analog I/O, redundant PC-based O-I (FactoryTalk View SE), and controls integration with vendor-supplied PLC systems. Engineering and design deliverables included schematics, network topologies, instrumentation plans, installation details, network latency calculations, PLC and O-I programming, testing, debugging, startup, and commissioning. Replicated services and deliverables provided at the Washingtonville location (see above) for this very similar FGDS WWT installation at an existing fossil-fueled generating station. One of 5 remote racks is pictured at left. In addition to interfacing with 18 PowerFlex variable frequency drives and 18 fixed-speed motor controllers in MCCs, these racks in total support over 600 field I/O points - digital, hard-wired analog, multi-drop HART analog, and metering pump control as well as multi-port manifold pilot valve control via DeviceNet. 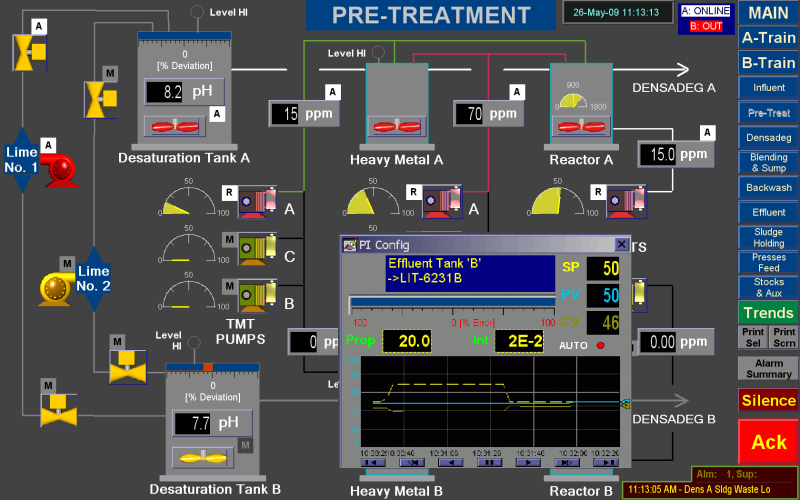 DuPont Spruance (Water Softener Plant: Richmond, VA) Wrote ladder logic and developed touchscreen O-I to control a 3 MGD continuous water softener plant. 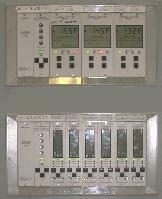 New A-B PanelView screens were developed for control of the softener plant and integrated with an existing hypochlorite generation control system. Instrumentation and control valves were selected and specified for the plant. Schematics and plans were prepared for use by the construction contractor. Duke Energy (Compressed Air Facility: Belmont, NC)- 2005: Provided construction documents for $3MM design-build compressed air supply system being constructed at an existing generating station. The electrical distribution system includes automated best 2-of-3 medium voltage service selection, protective relaying, and redundant 600V distribution systems. Prepared biddable electrical contract documents for a $6.5MM electrical system for a $63MM potable water treatment plant upgrade and expansion to 60 MGD. The work included cost-benefit analysis and detailed capital payback calculations for 5 medium voltage distribution system topologies as well as construction drawings, equipment and installation specifications, and construction cost estimates. The design includes 3 MVA of on-site diesel-fired generation with closed-transition peak shaving and the necessary inter-tie protective relaying. AlliedSignal Corp. (A-9 'D'-Train Emissions Reduction: Hopewell, VA) This $6MM project installed wet scrubbers on vent stacks in an existing hydroxlyamine production line: 3 scrubbers were installed as a single fast-track project that included pH, level, flow, differential pressure, and temperature instrumentation, control valves of several types, an numerous pumps for washing, purging, and circulation. The existing Fisher-Provox DCS was upfit with I/O and an additional SR90 processor to support the new control system load. Replacement of a 3,000 ton centrifugal refrigeration machine compressor, condenser, accumulator, and auxiliary lube systems: work included rotating equipment vibration, displacement, and bearing temperature monitoring, refrigerant stream and machine instrumentation, control valves, local and remote process variable indicators, revision and rearrangement of 4160 V, 2,500 hp motor starter elementary and protective relaying, and on-site startup and commissioning support. AlliedSignal Corp. (A-8/16 Caprolactam Remelt: Hopewell, VA): Installation of a $2.3MM purchased product reprocessing unit to improve the plant's ability to meet peak capacity requirements. This facility included conveying, blending, mixing, and circulation components - all analog loops, interlocking, and discrete sequencing was controlled by a Modicon PLC with touchscreen O/I. I provided all programming, tuning, testing, and commissioning. AlliedSignal Corp. (Y2k Compliance Analysis: Hopewell, VA): Inventoried 250+ plant Instrumentation and control elements which were candidates for Y2K compliance analysis, divided the research work among a team of engineers, and wrote testing and remediation plans for units where necessary. Supervised the testing, analyzed results, and reported results and recommendations to plant management. Analyzed the client's proposed application and worked with the client to develop performance requirements for a new controller. Designed the new solid-state "CX" model controller for mass-production by this original equipment manufacturer. 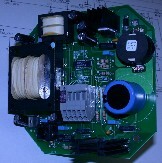 Engineering included the development, prototyping, and thermal stress testing of a 2-sided circuit board and associated components. The CX controller features highly accurate output (SP +/- 0.3%) seamless adaptation to water conductivity changes, output short-circuit protection, and flow-cell monitoring. Eastman Kodak (Powdered Coatings Facility: Charlotte, NC) Performed short-circuit analysiis, coordination study, lighting calculations; prepared lighting layouts, fire alarm plans and risers; and provided intra-discipline checking for this $21MM powdered paint manufacturing plant. Prepared procurement specifications for motor control centers, switchgear, AC and DC variable speed drives, and prepared construction specifications. 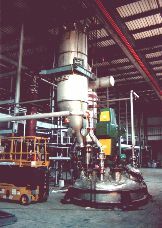 Chemical Specialties, Inc. (Arsenic Acid Waste Recovery: Harrisburg, NC)- 1995: Designed an A-B PLC based control system including safeties, controls, and power distribution for filter press, fume scrubber, slurry tank, filtrate pumps with dry-run protection, and associated fans and compressors. Proposed the process control concept, developed schedules, estimated costs, and implemented the proposal for a large environmental remediation project at an existing manufacturing facility. 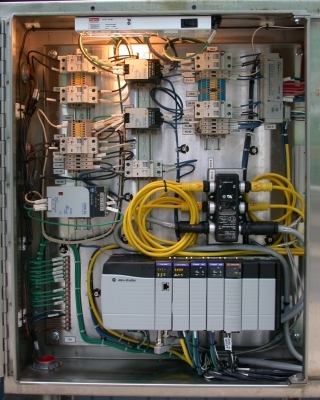 The in-situ solidification of 650,000 cy of material was accomplished using this control system which utilized RF links to mobile PLC's to form a client-server arrangement in which variable-priority control system tasks are distributed between mobile field equipment and a central stationary PLC linked to a PC-hosted database server. RF redistribution of historical and real-time process data was provided for supervising and QC engineers. Engineering and design of the power distribution and metering system on site was also provided as a part of this $60MM project. ITE executed every portion of the work - from development of the concept through drawing preparation, procurement, on-site supervision of electricians, programming, testing, debugging, startup, commissioning, preparation of operating manuals, and operator training. Hoechst Celanese Corp. (FY9 Spinner Upgrade: Charlotte - Dreyfus Research, NC)- 1993: Provided controls system design for prototype spinning machine under development by Hoechst R&D. This project utilized Allen Bradley PLC's to control all process heaters, variable speed drives, extruders, quench air, and spin finish mechanisms. Our responsibilities included engineering and design, equipment procurement, project management, construction oversight, checkout, and startup of this polymer thread extrusion and finishing process. 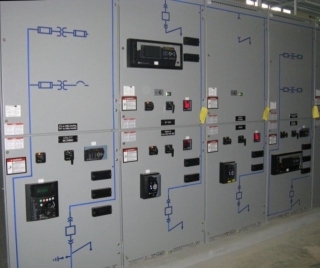 Hoechst Diafoil Corp. (Plant Power Distribution Monitoring & Control Syst: Greer, SC) Conducted an analysis of the plant medium voltage power distribution system and assembled a proposal to implement a pilot distributed control plant power monitoring system. Provisions were made for future expansion to monitoring and control of the entire plant power distribution system as well as other utilities (steam, chilled water, natural gas, etc). Provided conceptual design, scope of work, design and construction schedule, functional performance criteria, and itemized cost estimate. Provided electrical engineering for a $24MM monomer separation system consisting of distillation column, centrifuges, filtration, and associated equipment. The work included design for 1.7MVA of power distribution, lighting, paging system extensions, electric heat tracing, and ground-fault detection system. On-site construction support and configuration of variable-speed drives and line-carrier multi-circuit heat-tracing controllers was also provided. ReeMay (DuPont City, TN) Programmed Moore APACS Distributed Control System to operate drawstand floor equipment in a $26MM greenfield polymer web manufacturing facility. Tested, debugged, and commissioned drawstand, waste cutter-aspirator, speed controls for Siemens vector drives on the coordinated line, and HVAC equipment for the complete facility. Assisted with instrumentation debug and repair, commissioning, startup, and testing of the polymer prep equipment, extruders, lay-down table, thermoset binder, and winder on the line. Prepared all engineering documents for this $30MM greenfield plant in west Georgia. These included drawings for power distribution, process control, lighting, and building systems control. 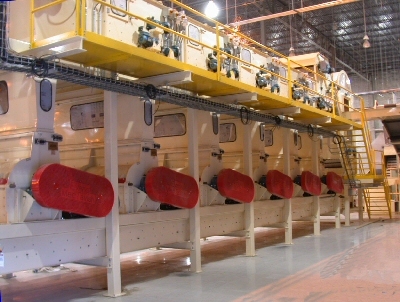 Process systems included batch mixers, belt flakers, chippers, air-operated material transport systems, rail car unloaders, reactor load cells, vacuum systems, polymer pumps, and Honeywell PLC interface. Site work, short circuit analyses, load studies and controls system planning were also provided. ITE handled procurement of variable frequency drives, coordination of electrical and instrumentation design, preparation and maintenance of instrument indexes, and scheduling of design tasks to meet construction deadlines. This was a design-build effort leading to an operational product line in this 138,000 ftý plant 6 months after groundbreaking. Allied Amorphous Metals ('A' Line Upgrade: Conway, SC) Programmed Allen-Bradley (A-B) PLC5 to operate metal caster, casting wheel, X-ray scanner, and carousel winders for a 1 micron, 4,600 fpm ribbon production line. The program included multi-mode analog loops for level, temperature, coordinated speed control of A-B vector drives with tach feedback, and stepper motor controls for caster position; device communications over DeviceNet, operator-interface (O/I) hooks for A-B RSView; and alarming, event trapping, and data export to A-B data acquisition software and Oracle Manufacturing Execution Software. Philip Morris (Lines I, II, III Machine Drives Replacement: Chester, VA) - 2001: Developed scope of work, engineeering estimate, takeoff for construction cost estimate, and the engineering and construction schedule for electrical, instrumentation, and controls to replace an existing DC-driven paper machine lineshaft with variable-frequency vector AC drives linked by fieldbus to a new DeltaV control system. Purchase specifications for the drive system and DeltaV control system were also provided. Westinghouse Electric Corp. (Turbine & Generator Plant: Charlotte, NC) Led project to replace fire detection and control systems in this 500,000 ft² facility with a new system incorporating combined FM radio and digital transmission and controls. Flame and linear heat sensors, optical fiber communication channels, and a programmable graphic operator interfaces were used to provide plant-wide protection and control.